I have been waiting for this book to arrive at the library since requesting it a month ago. It is madly in demand. Now that I have it in hand, I am perusing it with fervor. Tal Ronnen is the chef mastermind behind the Mediterranean plant-based restaurant Crossroads in LA and he’s got an infectious attitude and overall philosophy on food and life. His joy and creativity shine through on the pages of this book. As I am planting seeds in our garden, spinach and radishes when the crocuses bloom, I am planning all the wonderful meals to be made and the recipes to be tried using all those fresh vegetables. Cookbooks are a source of inspiration and recipes are general ‘guidelines’ for me. In our kitchen there is a lot of cooking by eye and by taste. I love this book because it is written for the home cook and yet I feel like a chef churning out these delicious plant-based dishes that are deeply flavorful, interesting (not the same old blah) and possess satisfying textures. For other plant-based cookbooks see my resource list here. Tal turned to plant-based eating overnight in high school and never regretted it. He experienced challenges with dinning out at a time when vegan menus were non-existent. He studied classic French cooking techniques (often centered around animal protein) all so that he could use those skills to create superior plant-based dishes. He goes on to write about the perceived restrictiveness of eating vegan and is on a mission to open our minds and palates to whole new world of vegan cuisine as well as techniques to ensure that vegan meals appeal to the general population. He wants us to get excited about cooking meat-, dairy-, and egg-free. 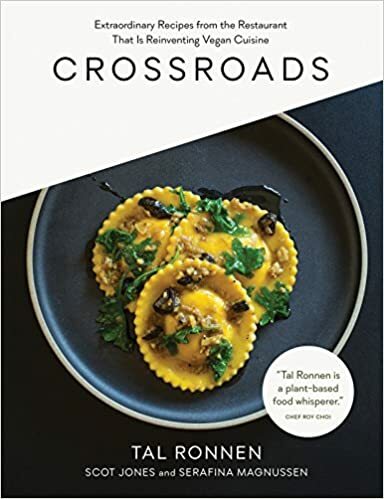 According to the writer of the Foreword, who happens to be a meat-eating and meat-cooking chef/restaurateur from down the street, “Tal Ronnen is the only chef who cooks for meat-eaters”. I smiled at this insight because that is exactly how I feel in my home…I am cooking vegetables for meat-eaters and the food has to be that damn good for them to eat it. Crossroads includes many great hints and tricks that are ever so helpful for a vegan in transition like me. With this book, I feel like I am in the know – not starring from the outside in. He uses nutritional yeast flakes which you can buy in bulk at any health food store near you in North America. Those who use it know the wonderful kick it gives to any dish including soups, sauces or dips. For those who have not tried it, it gives dishes a nice cheesy, nutty, savory quality that takes your dish to another level. Harissa is a spice mixture, used in Moroccan cuisine, that adds a lovely punch and complements other ingredients. It is a mixture of hot chilies, paprika, garlic, cumin, and coriander. You can easily find this as a dry spice mix or in a paste format at your local grocery store or you can make your own. I have to say that EVERY recipe in this book is top notch…my jaw is still on the floor. I make the recipes and the food tastes like you would want it to. This book is a must have for your Vegan cookbook arsenal. If you are transitioning to plant-based eating, this is an excellent cookbook to begin your journey. See Jane Grueber’s Photo Gallery here.